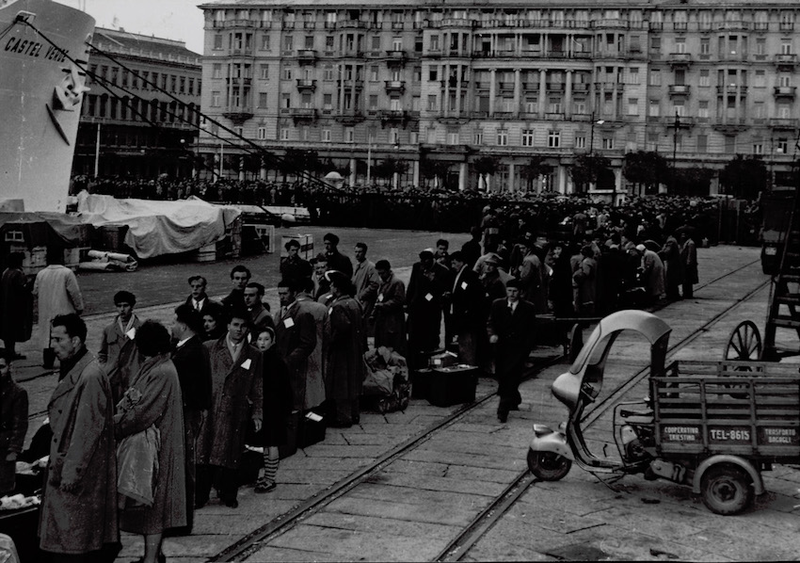 1954: the exodus begins: thousands of Triestines leave. Italy is coming back. When, back in October 1954, Italian troops entered Trieste in what Italian nationalism still represents as the “second redemption” of the city, the bases of great illegality were laid, and this illegality spread for decades, but now it is time to come to terms with it. Because the Italian government, just after receiving from the Governments of the United Kingdom and of the United States administration over what then was Zone A of the Free Territory of Trieste, taking advantage of the tensions of the Cold War, did soon allow the London agreements be trampled over. In the name of revanchism, fuelled since WWII had ended, and which made possible for Italian diplomacy to start a massive work to seize once again Trieste, that international free port that had already belonged – after the 1918 annexation / to the Kingdom of Italy. In 1382 Trieste had connected with Austria willingly and, since 1719, with the concession of the Free Port, it bloomed becoming a multicultural and multireligious city, which for 2 more centuries would be the main port of the Austrian empire. A point of reference for the whole Mitteleuropa, for which it was the natural maritime emporium. For centuries, a thorn in the side of the Italian peninsula: from the Republic of Venice to the Kingdom of Italy, that Adriatic port, the urbe Fidelíssima to Austria was a dangerous competitor that had to be destroyed and the occasion came with World War I, when Italy betrayed its own allies and cowardly sided with the Triple Entente in 1915. Thanks to the victory of its new allies, Italy could finally seize Trieste and a big portion of the Austrian Littoral: the free port was slowly weakened and reduced to a secondary port (as it is now) condemned without escape to see its precious traffics diverted to the ports of the Kingdom of Italy and ultimately suffocated by the autarchic Fascist regime. A regime ferociously hostile to the multiculturality of Trieste and of the Austrian Littoral annexed after WWI: many of the inhabitants were forced to emigrate, while those who remained had to see the destruction of their monuments that celebrated half a millennium of willing union with Austria, whey were forced to suffer the italianization of their family names and toponyms, in an operation that is no less than forceful removal of the identities and familiar origins, which culminated in the prohibition to speak the many languages of that land and the proclamation, right in Trieste, of Italian racial laws and the persecution of the Jewish community. At the end of World War II, the victorious Allied Powers recognized the strategic importance of the free port of Trieste and also its multicultural and multireligious nature, even if it had been brutally trampled over by the Fascist and the Nazi regime (after Italy surrendered in 1943, Trieste came under the control of Nazi Germany, being included in Operation Zone Adriatic Littoral – Operationszone Adriatisches Küstenland, I wrote a post about it: LINK). This is why in 1947, by virtue of Resolution S/RES/16 (1947) of the UN Security Council and at the coming into force of the Treaty of Peace with Italy, Trieste became the capital city of a new, independent sovereign State: the Free Territory of Trieste – FTT, entrusted to th adminsitration of its first provisional Government: the AMG FTT (Allied Military Government of the Free Territory of Trieste) which, from 1947 to 1954 made the port of Trieste flourish again, bringing ti back to its ancient glory and even allowing it to break all past records as for freight traffics and ultimately showing its great strategic importance for all of Europe, also in regard to the American helps for European Reconstruction (Marshall Plan). However, the tensions of the “Cold War” made impossible the quick transition from this provisional regime to the permanent one: the United Nations could not appoint a Governor of the FTT in the short times envisioned by the Treaty and, soon, the new Republic of Italy started working to suffumicate once again the new free port of Trieste, now established as a State corporation of the Free Territory of Trieste that granted special rights to the states of Mitteleuropa without direct access to the sea. And the tensions between the two blocs facilitated the return of an Italian administration over Trieste. So, in 1954 there was the handover between the Governments of the UK and of the US on one side and the Government of the Republic of Italy on the other. A transition between Governments in temporary civil administration, not sovereignty, byt Italy did immediatly start to simulate it and without difficulties thanks to tensions of the “Cold War”. For instance, even if with document P 091827Z APR 74 of 9 April 1974 the US Department of State reminded that the FTT exists regardless to the Italian simulation of sovereignty, and despire the confirmation of the United Nations, in 1983 – after the bilateral treaty of Osimo – that the question of the Free Teritory of Trieste can be resumed at any time upon simple request of any UN Member State, Italy kept denying the rights of the citizens and the rights of all States over the international Free Port of the FTT. Why? The answer is again propaganda of StateL the memory of the people of this international land has been buried together with the awareness of the rights of this unique, absolutely unique international Free Port. One illegal action after another, and propaganda of State that, from the Fascist Regime to the Republic of Italy did not show any significant difference, in the end, it was all revealed: the truth is now breaking the silence with the power of dignity, the dignity of a folk forgotten by history that is now standing to affirm once again its cancelled identity and to take its future back. But how was it possible for this illegality surviving for so long and becoming so powerful to shout the myths of the people of the Free Territory of Trieste for so long? From the reports of British Secret Services dating back to the administration of the AMG FTT, it was very clear that Italy planned to annex the FTT. An annexation built on the agreements between the strong, criminal powers, which would have granted to it the full control of the Territory. An inoxidizable pact among the so-called “strong powers” is something that Italy is used to, it is its took of choice to grant national unity. These “strong powers” which, as for Trieste, were (and still are) well represented by the powerful, deviated freemasonry, received economical and material aid, which allowed them to launch a massive, deceptive campaigns of propaganda, but also to create subversive groups that triggered social disorders and, by doing so, marginalized and then cut out the legitimate representatives of the citizens of the FTT, to the point they did even influence international, public opinion about the happenings in the “disputed” territory. At the same time, public administrations were subject to a massive injections of officers, mostly Southern Italians (especially from Sicily and Campania) who responded directly to the system of deviant, pseudomasonic-mafia: they were supported by Italian secret services. Such actions would be consolidated through the years, to the point they transformed Trieste in the last, actual colony of Italy: an historic relic of an “empire” that does no longer exist. 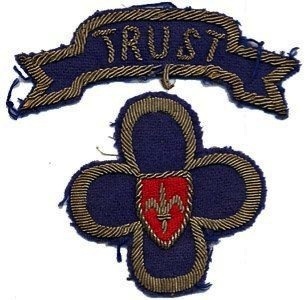 Follows the translation of a report (year 1951) of British Secret Services to the Allied Military Government of the Free Territory of Trieste concerning the role of the pseudo-freemasonries of Trieste and the infiltration – through these – of Italian secret services, still under the control of Fascist officers that affected both the FTT and the Eastern border of Italy. The “clan” of Sicilians described in this dossier must have left behind – probably, not by coincidence – a legacy: up to this day, the most represented group of functionaries of Italian public administration in Trieste – with remarkable roles in the Court of Justice – is formed by Sicilian employees, probably they are considered the most reliable. REPORT OF THE AMG (1951) ABOUT DEVIATED FREEMASONRY IN TRIESTE AND ABOUT THE CONTRAST OPERATIONS PUT IN ACTION BY ITALY TO PREVENT THE ESTABLISHMENT OF THE FREE TERRITORY OF TRIESTE. In Trieste, freemasonry is divided in two lodges. It is practically grounded on a secret organization like Southern Italian secret societies, known under the name of “mafia” in Sicilia or “camorra” in Naples. Like these, also freemason lodges have, as their main purpose, a function of mutual assistence in favor of their members; also, the lodges show anti-religious characters and use the name of freemasonry in order to be able to benefit of a certain sympathy by the British of American subjects residing in Trieste and holding officious or official roles in the Allied Military Government; they do, on their side, seem o be members of British or American lodges back in their respective hometowns. The lodge of the province of Trieste has its actual headquarter at the circolo della Cultura e delle Arti (club of Culture and Arts) in piazza Verdi. It is called the Loggia Rossa (Red Lodge) as it originated from a scission with the Loggia Scozzese (Scottish Lodge). Among the dignitaries of this Loggia Rossa there are professor Cammarata, lawyer Forti, engineer Nunzi and Mr. Libutti. Among minim members there are engineer Doria, Mr. Palutan, presidente di zona (president of the Zone), Mr. Poilucci, Mr. Franzil, Mr. Puecher (socialist), lawyer Volli (republican), colonel Fonda Savio. The other Loggia Scozzese (Scottish Lodge) or Loggia Tricolore has the main headquarter either in Bari, via dei Rossi No. 131 at Mr. Giaconi’s or at Doctor Demetrio di Demetrio’s in via S. Nicolò No. 2. As for Trieste, this Lodge has, among notable persons, general Rizzo, to be regarded to as one of its leaders, together with Mr. Monciatti (Uomo Qualunque front), colonel Romano Manzutto of the Military Distric, aeronautics section, Mr. Orlandi of the same District, Mr. Grubissi of the Procura di Stato (Prosecution office of the State), lawyers Gerin – a father and his son – the father being a functionary of the Missione Italiana. Mr. Libutti, his bound to the lodge in piazza del Popolo in Rome notwithstanding, does also belong to the above mentioned lodge in Trieste. As several functionaries of the Presidency of the Council of Ministers and of the Italiani Ministry of Domestic Policy do, some of them going back and forward from Rome to Trieste. Among these, there are: accountant Rognoni, the Prefetto Mr. Silvio Innocenti, colonel Bellini, Mr. Pierotti. Also, other members are Origone, prorettore (Vice University Rector), one of the leaders of the section of the Monarchic Party in Trieste, president of catholic graduate in via Battisti No. 13, Mr. Battaglia of the Lega Nazionale and leading elements of the MSI (Italian neo-Fascist party) of Trieste (colonel or major Mattiussi of the Mutilati) and, at the end, various, former candidates of the former Blocco Nazionale (National Block). This lodge benefits of funds received from the Ufficio Zone di Confine della Presidenza del Consiglio (the Office of the Presidency of the Council of Italian Ministers for the Bordering Zones) (Mr. Innocenti). Also, various police inspectors belong to it, among them Mr. Salvati, Mr. Burranello (expelled), which are considered trusted elements and have the duty to keep under control various officers of the Polizia Civile (Civil Police) of Southern Italian origin. As for magistracy, among the succube adepts there are pretori Pietro Rossi (Sicilian), Mr. Locuoco (Sicilian); deputy State prosecutors Mr. Franco junior (Sicilian), Mr. Grubissi od the MSI, holding minor duties. Even Procuratore (Prosecutor) Mr. Santanastasio is kept under control, through Lawyer Gerin. The Missione Italiana is controlled Through Mr. Innocenti and so is the State Prosecutor Mr. Pellegrini (fearful). To said Lodge, do also adhere Mr. Vitanzo (Sicilian) First President of the Court of Appeal and Mr. De Franco father (Sicilian) Presidente di Sezione della Corte d’Appello, which is himself kept under strong control. The lodge does also have strong influences on Mr. Santomaso, President of the Court (weak) and on Mr. Falchi, consigliere d’istruzione (Education Counsellor). Between the two lodges, that in Piazza Verdi, so the Rossa, has more people involved into economics (Mr. Guicciardi, an engineer at company “Aquila”, Mr. Rozzo, from bank Cassa di Risparmio, some head figures at Cantieri Riuniti dell’Adriatico (engineer Aurelio), Mr. Piccotti, Mr. Tommasini, captain of the Tricolore; as for culcure, University professor Mr. Roletto. The Loggia Rossa says to be Justinian, but it has never been offically recognizes, while there is a sub-species of lodge said “antonianea” to which belong Mr. Piccotti, Mr. Szombathely, Mr. Andrj, former candidates of the Blocco Italiano. This Antonianea fis the connection between the Rossa and the Scozzese Tricolore. It results that Bishop Monsignor Santin receives, at his house and as friends, representatives of both lodges and also of the third one, namely said: Mr. Cammarata, lawyer Forti, Mr. Origone, Mr. Szombathely, etc. Among said visitors, there especially is Monsignor Labor, parish priest of San Giusto, former doctor and former Jew and considered a close confidant and friend of the Bishop. Practically, said lodges, despite being in conflict between them and considering the Loggia Tricolore and certain elements of the Rossa as “transfughi” (bolters) (see Mr. Nunzi) get along well on many matters and support each-other. The recent campaign of propaganda of the press on the “Corriere della Sera” (articles signed by Grazzini), of the “Giornale di Trieste” and of the “Messaggero Veneto”, has been prepared in agreement by the various lodges and the Liberal Party, the Uomo Qualunque front, the Monarchic Party (Mr. Grasso, vice-president of the Lega Nazionale) etc. The spoken campaign has been triggered and inspired by certain functionaries of the Presidency of the Council of Ministers – Ufficio Zone di Confine – with the support and agreement of Mayor Bartoli, Mr. Palutan, Mr. Franzil and come more democristiani (members of the Christian Democracy party) which has a role in the administration, but does no have direct influences from the party’s division in Trieste. As for this, keep in mind that the party of Democrazia Cristiana as a whole has disregarded this campaign and, due to this, we consider that the rettifiche (press corrections) by Mr. De Gasperi in a conciliatory and moderate way as for that had been denounced, even with a motion by parliamentarians Mr. Lucifero and Mr. Randaccio, is due to a reserved report that Mr. De Gasperi received from the political secretary of the Democrazia Cristiana, Mr. Romano, following an agreement with Mr. Degano and Mr. Delise. The MSI is mostly against Freemasonry, (Mr. Colognatti) and it is not among the promoters of this this press campaign with precise purposes. The main promoters result to be, on the contrary, Mr. Forti and Mr. Cammarata (they reconciled), Mr. Fonda Savio, Mr. Libutti (substituting ill Mr. Innocenti), Mr. Bartoli, Mr. Palutan, Mr. Franzil, Mr. Gerin of the Missione Italiana, Mr. Fragiacomo and Mr. Rovatti of the CLN (Comitato di Liberazione Nazionale – National Committee of Liberation) of Istria. The author of the articles published on the “Corriere della Sera” of Milano, Mr. Grazzini, who come to Trieste because of the exhibits of the Fiera, was send, besides from the ones above mentioned, also by Tranquilli of the “Giornale di Trieste” whose right hand is editor Ugo Sartori, from Koper, anti-British, Fascist, who uses pseudonyms Gianni Schicchi, by Carlo Tigoli, director of the “Messaggero Veneto” and of Mr. Doria. Also, with their advice, also the functionaries of the Ministry of Domestic Policy, Mr. Libutti and Mr. Bellini took part to that, along with Mr. Pierotti of the Prefettura of Trieste. As for elections, it results that, as for the Democrazia Cristiana, Mr. Bartoli, Mr. Palutan, Mr. Franzil, Mr. Venier and Mr. Sciolis have a deal with lawyer Jaut for an alliance, but only in part, with the Italian block, excluding the MIS. The ones against this action are the directors of the DC (Mr. Rinaldini) and these of the socialists (Dr. Lucio Lonzar). Commander Cardona of the Loggia Tricolore results number 33 of the executive. He is the former leader of the seafarers, well known as a Fascist. Another member of this lodge is Ms. La Vince, goddaughter of general Rizzo at the registration office.